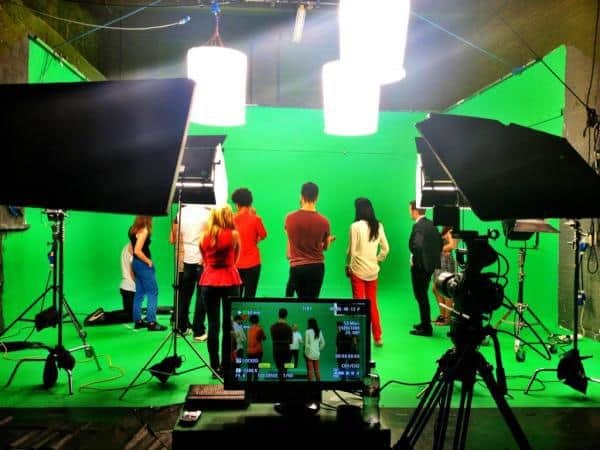 Greenscreen filming promises the possibility to create almost any type of scene in a studio environment. A lot of film and video production is problem solving, whether that is balancing a budget, figuring out how to light a difficult position or bringing an ambitious shot to life. Greenscreen can offer solutions to these problems. Some filming can only be filmed against greenscreen, for example most special effects. 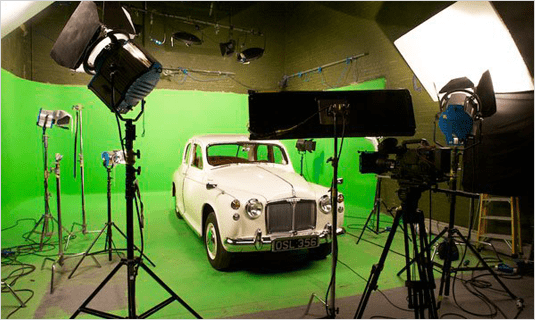 More popular at Camberwell Studios are explainer videos featuring a presenter to camera – where the background will constantly be changing with words and graphics in line with the spoken word. Projections that will be used outdoors at music festivals or to light up building for special effects will usually be filmed against green. We regularly get puppeteers in, usually dressed on green morph suits. Like any shoot in a studio environment there is a greater chance to manage a predictable filming process – for example you wont have to worry about the weather, it’s always sunny. You can be in ten cities in a day. Greenscreen filming gives creatives a blank canvas for their ideas. Even simple ideas that dont require much specialist post-production can bring an idea to life in a – hiumans and cartoons can easily interact. A good example of the blank canvas is the use of virtual studios where, to all intents and purposes a TV news presenter can appear in the middle of a 100 screens purportedly showing events from around the world – whereas in reality they are in a small green room of the sought circular. Here we describe some typical applications of greenscreen shooting here at Camberwell. They provide a good insight into when and why to shoot greenscreen. Music videos have total creative freedom, there’s no reason you can’t have a 100 foot tall band performing on the cliffs of Dover or a ‘Ghost in the Shell’ inspired android being assembled as she sings. Greenscreen enables creative vision to become reality. 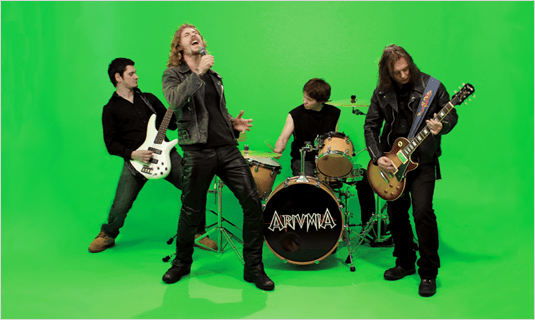 Shooting an artist or band on greenscreen allows you to place them in any location you can think of. When you want to project a ballet dancer on the side of a 16 story building using projection mapping then you will need a clean alpha layer of the ballet dancer to composite onto the building map. (Image of Croydon projection) Filming the dancer on a well lit greenscreen is the obvious decision. Your client has asked you to shoot a video of presenters in a newsroom but the budget doesn’t come close to building a newsroom set. With a greenscreen studio you can use a tricaster to take a feed from multiple cameras, live key out the green screen and replace it with a virtual newsroom in real time. You need to shoot a presenter on an infinite white background with graphics and animations popping up behind and around the them. By shooting on greenscreen you can key out the back ground, replace it with a white background and then you also have a presenter on their own alpha layer allowing the animations to easily move behind them. If it was only going to be a white background with no animation then the best course of action would be to shoot it against a white cyc which is also available at Camberwell Studios. Fixing it in post – a phrase that suggests most problems in the filming process can be fixed in post-production, usually by the special/digital effects specialist. This may be true, but the cost may make it prohibitive and/or the result will not be as good as if it had been filmed correctly in the first place. Filming ‘in-camera’ decribes the trade-offs between filming the real thing or faking it. For example, if you want the subject standing against a mountain background the best place to film is in front of the mountain. It can’t look anymore real than being real – if the budget allows. We most commonly encounter this question when deciding whether to film a subject against a real, painted white background or shoot against green and turn to white in post-production. The shot will almost certainly look better filmed against a real white background, but this may not allow enough flexibility in terms of what you seek in the rest of the film frame. The TriCaster is a suite of hardware and software products that allows you to record live green screen video and mix it with pre-recorded broadcast graphics, virtual sets and special effects including audio mixing. This can be streamed live into social media publishing and web streaming applications.